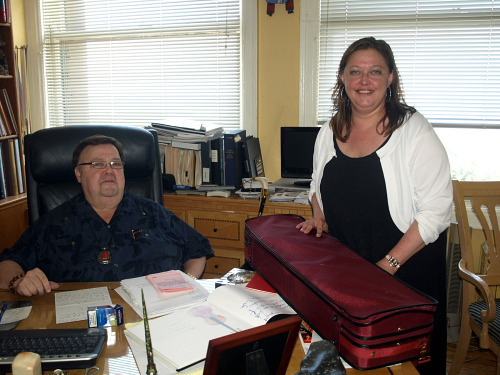 "Well, I thought you might like to try this one," said Geoff Fushi, and at this, his daughter, Suzanne Fushi, started to unpack a very normal-looking red violin case. I knew exactly what was in there, and the adrenaline immediately began to flow. "The 'Vieuxtemps' Guarneri del Gesù?" 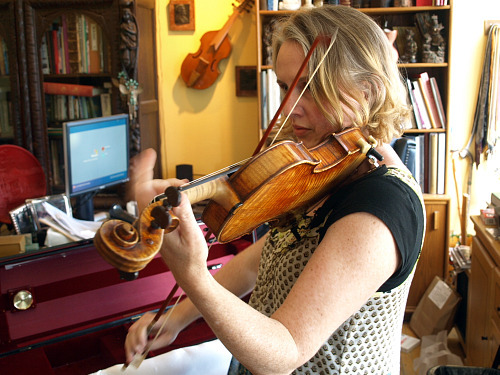 I'd only planned to have lunch with Suzanne, director of the Stradivari Society, an organization which has become so important in matching fine instrument investors with violinists, many whom I've interviewed on Violinist.com. Of course, I did know that the 1741 'Vieuxtemps' del Gesù was residing in Chicago at Bein and Fushi, the same place where the Stradivari Society is headquartered, on the 10th floor of Chicago's Fine Arts Building. I'd ridden up there on an old-fashioned hand-operated elevator, expecting to tour the shop and hear a bit more about the Society. But to actually see the 'Vieuxtemps' del Gesù? To play it? It's the violin that the famous violin dealer Arthur F. H. Hill wrote about as having "probably the grandest tone of them all" some 120 years ago. 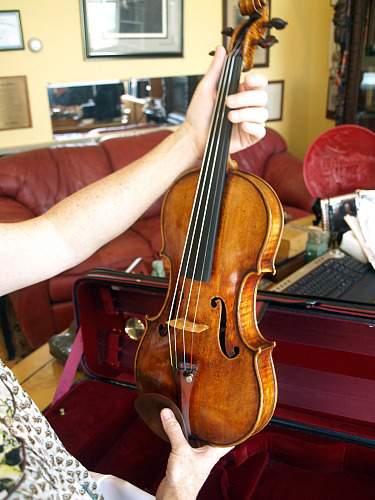 It's the violin that currently has an asking price of $18 million. My hands began to tremble, picking up the violin. I simply looked at it for a while. It's beautiful -- rather light in color, like honey -- and warm. I strummed across the strings. Oh geez, it was totally out of tune, I have to tune this thing? What if I break it or drop it or something comes flying off? These are irrational thoughts for someone who has tuned a violin well more than 10,000 times. But consider the circumstances, here! I gingerly turned a peg. It felt pretty much like tuning a violin. I know how to tune a violin. I also know how to play a violin. Let's give it a go. I played some open strings. Wow, immediately I heard the tone. It's just right. What to play, what to play? Vieuxtemps played this violin, Ysaye played this violin, Menuhin played this violin, and more recently, Philippe Quint, Vadim Gluzman and Joshua Bell...what is this big boy violin going to think of little me? I played that nice rolling beginning of the Bach G minor Partita. Oh, that's okay, but it was not impressed with me. Not enough to tell me any secrets. What to play? A little Meditation? Again, just okay. I'm not really a Paganini Caprice person, but maybe it would like the Tchaik Concerto. I tried it, but the heavens did not open. Wait, wait, Saint Saens – French music perhaps? I tried the beginning of Introduction and Rondo Capriccioso. Ah, yes. This was catching on. So sweet on certain notes, and yet it asked for restraint. No need to hold anything too long, don't draw anything out. Simple. Sweet and simple, here's the definition of it, right in this sound. Keep it sweet and simple. But wait, do this one over. I found myself playing things slower, not to draw out the music, but to find the groove. If I'd had longer, I would have gone through it all, just to listen to what the violin was saying and to catch it right, so that I could go back and hit it on-spot, with the short and sweet style. "I could play it all day," I mentioned. I didn't get the idea that this was going to happen. Geoff smiled, "I brought a Strad for you to play, too, the one played by Tivador Nachèz." I know who that is. He did the arrangement of the Vivaldi Concerto in A minor that so many people play, that appears in the Suzuki books. I tried the opening of the Tchaik Concerto on the Strad. My gosh did this thing sound different! My first thought was "my old German factory violin" but that was unfair. It's just hard to step off of a Ferrari and immediately drive away in a Lamborghini. (Okay, I've never driven either, but I'm assuming they feel different!) It didn't want Tchaik. What to play? I cast about, played this, played that. Nothing. Oh duh! "You want to play Vivaldi, don't you!" I played the opening of the A minor Concerto. WOW! This was actually even more thrilling to me than the Vieuxtemps because it really, really responded. It was so easy, I was just riding the wave. Of course it knows this piece! I switched to the last movement, and when I played the first high 'C' with just a bit of vibrato, I almost laughed with glee. How can I explain what that "C" did? It just wasn't even my "C," it was completely joyous. Then it took me wildly forward: it wanted it fast, it wanted certain articulations, it truly felt like the fiddle was happy. We could have had a very long lesson, that Strad as teacher, I as student. Somehow I just hadn't thought of Baroque music for a Strad, which is silly, but I thought it would want something really virtuosic. It seemed happy with an old friend, the Vivaldi. It occurred to me, with these violins, that one needs to make a connection with them. I wouldn't try to play something wildly new or out of the repertoire, the first time I played on a fine instrument like these. You have to really pay attention, let it tell you how to play it. I imagine this might take years. Then you would know how to lead it in various directions. I suppose this process is much abbreviated for people who play elite violins on a regular basis – though I would be curious if they, too, find that they have a learning curve. These seem like deep instruments to me, with well-established personalities. You don't want to go against their personalities. I do believe that, in fact, they will not let you. A sound clip would have been the cherry on the cake! Dion, it would have been, but this really was a surprise. I was just playing a little bit of this and that, and the only one in the room with a video camera was my daughter, with her cell phone! She got a few little clips, but she got only a very short clip of the del Gesu before I switched to the Strad. Joshua Bell playing Ysaye on this violin and also talking very eloquently about it. Kristof Barati playing Schubert's "Erlkönig." Or, you could start charging v.c members $1 every time they type the words "shoulder rest" in a thread. Oh, what fun this was to read! Got a vicarious thrill out of it all. Fabulous description of the whole experience - thanks for sharing so eloquently! Laurie: it is true that great instruments sound sweet to the ear of the player. They have in qualities something close to the bel canto. But for the listener, they project far in the concert hall and , with ease and effortlessly, everything comes out naturally. Some instruments sound loud right away...does not mean that they project or that their internal resonance is appropriate. What a wonderful experience! I am having a serous case of del Gesu envy. The pics are terrific. They give new meaning to the term beatific. Makes it easy to imagine how you were feeling. Every once in a while when I go to my local luthier, I happen to be there at the same time as one of their customers who has a Guarneri. I would never have the nerve to ask him if I draw my bow across the strings once or twice, although the thought has occured to me. Guarneris are supposed to be much harder to play than Strads, but more rewarding in the long run. More "oomph"
I guess that's why Heifetz played his Guarneri even over the famous Dolphin Strad. Call me a skeptic, but here's the question. Give an honest answer if you can. If you laid out 10 violins, 8 of them in the $10-40K price range (from makers like Alf, Burgess, Needham, Borman, Grubaugh and Seifert, perhaps a few contemporary Italian fiddles), and added the Strad and the Vieuxtemps to round out the list, do you think you would pick out the two masterpieces as the two best instruments? Perlman once said that he could always tell as he walked into a room if someone was playing a Strad. Usually, when playing a Guarneri, it was often said that the internal resonance is so outstanding that the player gets completely lost at first and has to adapt his playing to the instrument. I believe that it is what happenned to Laurie. It is difficult to control the very best intruments of del Gesù. Menuhin was a Strad violinist until the end of his career. He bought the "Lord Wilton" and said that the instrument could forgive him not to be always perfect. Smiley: there is a difference. Wood was of much better quality at the time of the Cremonese than today, with all the pollution and the degradation of the forests. Even Vuillaume used old pine and maple for some of his violins. I do not say that there are no outstanding modern luthier. Sometimes, their violin are even more perfect in terms of construction. But having heard many soloists played on modern instruments in the concert hall, the difference with violins such as the Leduc Del Gesù or the Marsick Strad of Ehnes is quite obvious. The carrying power of these Cremonese instruments sounds like a bel canto singer. Instruments can be loud, like voices, but that is'nt just enough. Many moderns do have a strong sonority... Internal resonance has a lot to do with the quality of the instruments. This is what is so special about the best Cremonese. Laurie: te C bouts of the Vieuxtemps are quite damaged compared to the Strad. This should be a big issue for a serious buyer. They are hooked like and that is one of the features of Del Gesù in the last period. But they seem to be worned. Usually,you do not see this in the top cremonese. I went to a concert recently and Soovin Kim was the soloist. After the performance, I asked about his violin and he was playing a Zyg. He said he wanted something with more power and his Strad wasn't cutting it. 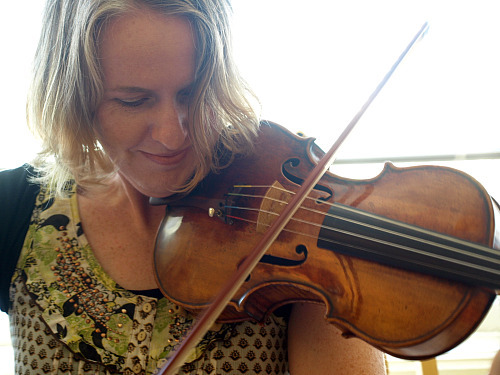 I know that Laurie firmly believes in the mystique of the old Italian fiddles; that somehow, they have a magical quality that modern makers cannot replicate; however, I am not convinced. That said, I have only played on one Strad, so I do not have much basis from which to form an opinion; just my hunch and what I have read about blind tests, etc. 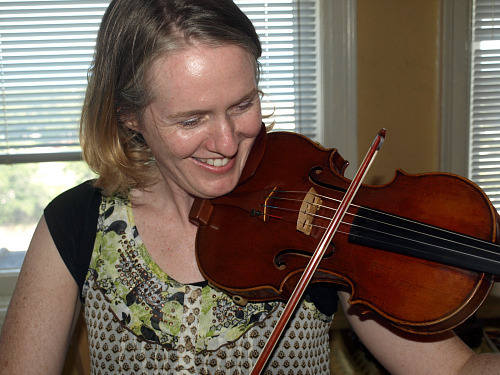 I have also played a few fiddles that were upwards of $100K, and I personally was not able to discern any special qualities that made them any better than a good $10K instrument. I don't doubt that there are some amazing old Italian fiddles. Perhaps the Del Gesu and the Strad that Laurie played were in that category. But, I also think there are some amazing instruments made by contemporary makers. Are they as good (better?) than the old Italians? I guess that will always be a controversial subject -- perhaps an intractable question. Laurie, you look like you were having so much fun playing those beauties. Your description of learning from the violins was wonderful. You're so lucky! We're lucky, too, to be able to read about your experiences. "Perlman once said that he could always tell as he walked into a room if someone was playing a Strad." Do you think that by "someone", he meant "a fellow virtuoso violinist", or did he mean "anyone"? Would he be able to tell if an amateur like me were playing a Strad, or not, for example? Excellent Blog, Laurie. That must have been fun. After liestening to the Guarneri I still like Aaron's Rosand's del Gesu better than any I have heard. Yes, I know he recently sold it. I cannot answer Smileys question, but when I played that Montagazza Boy! what a huge difference it was from the $15,000 violins I played! Fine old Italian violins... there is nothing like them. How wonderful and a joy they are to play!